Bangalore is the third busiest airport in India (and the busiest in south India), with almost 27 million passengers a year and more than 600 airplanes a day. It has flights to 46 domestic destinations and 21 international destinations. This brand new airport was constructed by a private company and started operating in May 2008. The airport replaces the old, much smaller, Bangalore airport that was located in another suburb closer to the city center. Despite having much improved facilities, the main issue is that the new airport is located a long way from the city. Bangalore airport is notably also the second fastest growing airport in the world, with nearly a 30% jump in air traffic in the second quarter of the 2018-19 financial year ending September 2018. The airport is being expanded in two phases. The first phase, which was completed in 2013, doubled the size of the airport's terminal and increased check-in, baggage screening, and immigration facilities. The second phase commenced in 2015, and involves the construction of a second runway and second terminal to alleviate capacity issues. The second terminal is being built in two phases -- the first phase will cater to 25 million additional passengers by 2021, and a total of 45 million additional passengers by 2030. Once complete, the combined handling capacity of the airport's two terminals will be 65-70 million passengers a year. Terminal 1 will be used exclusively for domestic flights once the new Terminal 2 is commissioned. The design of Terminal 2 is focused on the environment and sustainability, and will create a garden ambience for flyers. The second runway is expected to be ready by September 2019. Other developments include the implementation of a new airport security screening system by the end of 2018. Men and women will be screened together, and will no longer have to line up separately. The new streamlined process is expected to reduce waiting time significantly. There are also plans to install digital signboards to predict the amount of time it will take for passengers to clear immigration. Kempegowda International Airport(BLR). 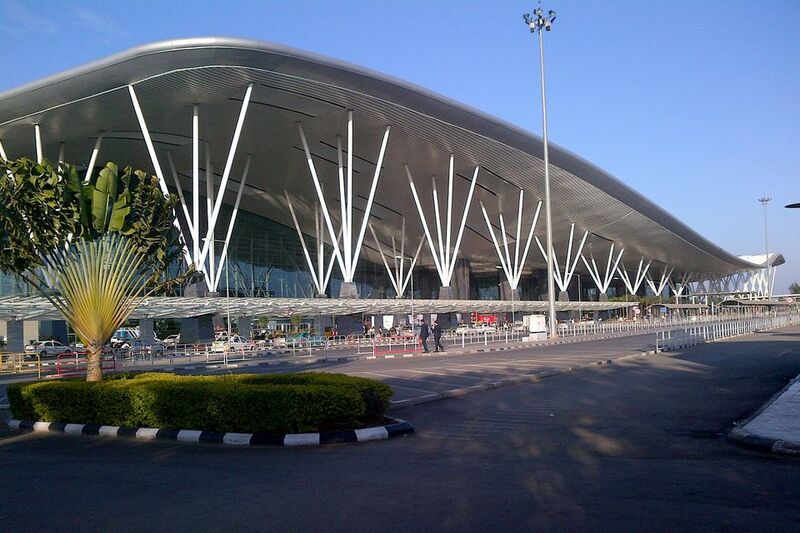 The airport was named after after Kempe Gowda I, the founder of Bangalore. Toll free 1800 425 4425 for general information and flight inquiries, 24 hours a day. Devanahalli, 40 kilometers (25 miles) north of the city center. It's connected to the city by National Highway 7. Approximately an hour but can take up to two hours, depending on the traffic and time of day. Both the domestic and international terminals are in the same building and share the same check-in hall. The building's lower level houses check-in and baggage claim facilities, while the departure gates are located on the upper level. Free wireless internet is available in the terminal building, however users must get a password sent to their cell phone. Porters can be hired to carry luggage. The charge is 200 rupees for domestic and international departures, and domestic arrivals. It's 300 rupees for international arrivals. Money exchange counters and ATMs are available. The terminal has a shopping area, with various shops and duty free outlets. A left luggage facility is provided in the arrivals area. The cost ranges from 250 rupees for up to 12 hours, to 2,500 rupees for up to 120 hours. Maximum duration of storage is five days. VIP Lounge caters to departing dignitaries and eminent persons. Plaza Premium Lounge, setup by the world's leading airport lounge provider, accepts select Air India and Jet Airways passengers, Priority Pass cardholders, select American Express and other credit card holders, and paying passengers (buy a lounge pass online here). It offers a wide variety of food and beverages, bar, business center facilities, showers, massage and spa. Above Ground Level Lounge is a stylish and spacious lounge that offers value-for-money buffet dining, bar, and business center. It can be accessed by Priority Pass cardholders, MasterCard Club Members, Diners Club cardholders, and paying passengers. The airport's car park can hold up to 2,000 vehicles. It has both short-term, over night, and long-term zones. Cars can expect to pay 90 rupees for up to four hours, and 45 rupees for every additional hour. Rates for one day are 300 rupees, and 200 rupees for every additional day. Passengers can be dropped off and picked up for free outside the airport terminal, as long as vehicles don't stop for longer than 90 seconds. A meter taxi from the airport to the city center costs around 800 rupees one way. Taxis wait in front of the terminal building and in the designated area. There's also a prepaid taxi counter at the terminal exit. Popular app-based cab services Uber and Ola operate from the airport as well, and have dedicated pick-up zones. The Uber Zone is located behind Cafe Coffee Day, and the Ola Zone is near P2 parking just after BMTC bus stand. The fares are a bit cheaper than regular meter taxis. However, as taking a taxi is costly, many people prefer to use the airport shuttle bus service provided by the Bangalore Metropolitan Transport Corporation. These Volvo buses are scheduled to depart every 30 minutes, around the clock, from various locations around the city. The cost is 170 to 300 rupees one way, depending on the distance. Do note that auto rickshaws are not permitted inside the airport. Passengers can be dropped at the entrance to Trumpet Flyover on National Highway 7 and take a shuttle bus (cost 10 rupees) to the airport. Bangalore airport often experiences fog from November to February early in the morning. If traveling at during these times, do be prepared for unexpected flight delays. Bangalore airport has a transit hotel, opened in September 2014. New branded hotels are being built to meet demand, but these will take a while to be completed. This Guide to Bangalore Airport Hotels reveals the best options. Most of these are holiday resorts and clubs in the surrounding vicinity.